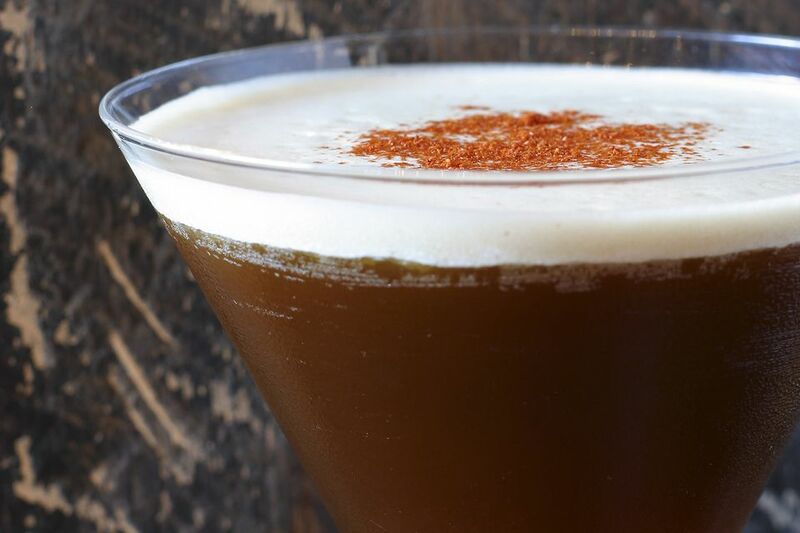 The pumpkin spice martini is an interesting variation on the standard pumpkin martini. Unlike many other recipes which use vodka, this one features the robust flavor of rye whiskey. It's a fantastic cocktail for autumn and makes a wonderful dessert drink, particularly when paired with anything that includes chocolate. This drink has a multi-dimensional taste that is anything but boring! On top of the whiskey foundation, you'll add ​a pumpkin liqueur, a hint of orange, and a little anise to really punch up the flavor. While the egg white is optional, it does add a pleasing creamy top that finishes the martini off wonderfully. In a cocktail shaker, pour all of the ingredients. Add ice, then shake vigorously to ensure the egg is properly mixed. Sprinkle grated nutmeg or cinnamon on top if desired. If you choose to add the egg, you'll find that this recipe is best when you use the double shaking method described. The first round is done as a dry shake and the second includes ice and should be shaken for at least 30 seconds. Taking the time for this will ensure you get a wonderful froth in the finished cocktail. There are a number of options available for each of the distilled spirits in the pumpkin spice martini. If you don't have one of the specific liquors called for in the recipe, don't worry because you may have a viable substitute. Rather than rye whiskey, a bold bourbon like Wild Turkey 101 or Bulleit can stand up nicely in this recipe. A great reposado tequila is an impressive option as well. Pumpkin is a seasonal liqueur that can be hard to find at times. It will vary from year to year as it's not the most profitable flavor for liquor companies to produce. Bols Pumpkin Spice and Hiram Walker Pumpkin Spice are two that tend to stick around. If you can't find one, try about 1 ounce of pumpkin spice syrup. These tend to be readily available because they're used to flavor all those pumpkin spiced lattes that pop up in the fall. As with any cocktail, triple sec is not your only orange liqueur option. You could pour a curaçao or a brandy-based option like Grand Marnier instead. For the anise liqueur, you have a number of options. Absinthe is really nice here, but Abisante, Herbsaint, or any of the other liqueurs of this flavor are just fine. This flavor is key to adding a little more depth to the pumpkin flavor. It's understandable that some people are wary of drinking raw eggs. You can either skip that entirely and enjoy a non-creamy cocktail or substitute it with about 1/2 ounce of half and half. How Strong Is a Pumpkin Spice Martini? The alcohol content of the pumpkin spice martini is going to vary depending on the liquors you choose to mix into it. With an 80-proof whiskey, 90-proof absinthe (typically the lightest option), and the average for the liqueurs, it will come in at a hefty 23 percent ABV (46 proof). That's lighter than the average liquor-only martini but still stronger than many sweeter cocktails.